Quick Low Carb Blueberry & Vanilla Cake – decadently delicious; effortlessly easy! 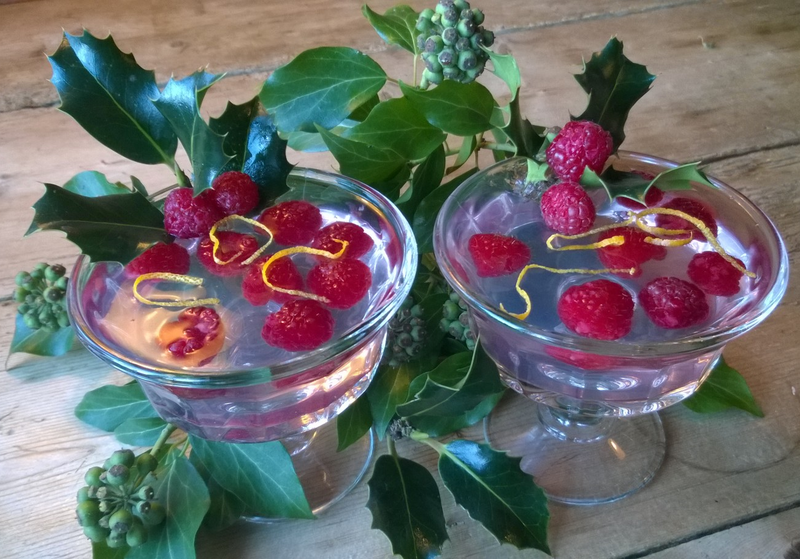 Or substitute raspberries for an ultra low carb treat! Any diet where pudding is possible is certainly a winner in my book! One of the only difficult things about a low carb, ketogenic diet though, is the lack of readily available ‘snack’ items or desserts. There are times when you really crave something sweet, yet nothing is commercially available which seems to cut the low carb mustard! To remedy this, I always make sure to have a stockpile of cake and low carb biscuits pre-prepared and ready to hand. This way, you always know that what you’re eating is keto-friendly and in plentiful supply. Well this recipe is one such staple! It’s incredibly easy to do and ready in just over half an hour. This means that even if you’ve already started preparing dinner, you can still whip up a last minute wonder that’s deliciously tasty and nutritious. Once made, I often cut the cake into one-portion squares, so they’re ‘ready to go’ when you are… For that reason alone, this recipe has become a staunch favourite – few things could be simpler or more satisfying! In this particular version, I’ve chosen to include blueberries. At circa 9g net carbs per 100g, they’re one of the few fruits which are truly keto-friendly. And even if 9g still sounds on the high side, please bear in mind that we’re only using 3/4 of this amount for the whole cake. 75g of blueberries is more than sufficient for our needs; the flavour permeates the cake mix and forms beautiful pools of dark inky blue, which is ultimately all we could ask for! If you’re still feeling shy of the additional carbs, give this recipe a go using raspberries. They’re practically half the carbs of blueberries at circa 4.8g. Their flavour is just as delicious and their colour equally profound. Other substitutions would be coconut flakes, cocoa or macadamia nuts. Or why not try a scaled down mix of the lot for a truly indulgent low carb treat! Any of the above options are sufficiently low in carbohydrate to make this dish eminently suitable for diabetics, paleo-dieters and those on a ketogenic plan. There’s also no glucose, so coeliacs or those with an intolerance to wheat can also enjoy this recipe. It’s a true ‘all-rounder’, so I strongly urge you to give it a go post haste! To make the cake, measure up 6oz of xylitol sweetener and 6oz of unsalted butter. I always use xylitol in baking. In my experience, it’s the only sweetener which retains its sweetness once cooked; and its granular texture means that it behaves exactly like sugar in cake-recipes. Cream the two together by hand until they’re light and fluffy, then give your hands a good wash to whisk up the eggs. Break 3 eggs into a bowl and whisk lightly with a fork until smooth. If you’re using vanilla-pods, scrape out the seeds of one pod and add this to the mix. If you prefer dried vanilla powder (as I used), half a teaspoon should be more than enough. You can equally use vanilla-essence, but this tends to contain liquid sugar-syrup, which isn’t ideal from a carb-perspective. If you choose this option, make sure to read the label carefully and buy a production without additional sugar. Incorporate the egg into the creamed butter and sugar a little at a time. Again, I always find that using your hand allows the maximum quantity of air to be locked into the mix. Tilt the bowl at an angle and fluff the mix upwards so that the motion elevates the mix rather than flattens it (as will happen if you go at it horizontally with a spoon). Weigh up 6oz of ground-almonds and stir in 1 teaspoon of bicarbonate of soda. Fold this into the mix; again at an angle, making sure to lift and turn, so that the mixture rises and falls back onto itself. It’s best to use a sturdy metal spoon, as this will afford you the greatest control. Fold the dry ingredients in until you have an obliging dropping-consistency, which is a delicate pale yellow in colour. Roughly measure out your 75g of blueberries or raspberries and fold these in at the last minute. Once fully incorporated, spoon the cake-mix into a buttered baking dish (I used a medium rectangular dish, but this can equally go into a round cake tin if you prefer…). Bake in a moderate oven for circa 25 minutes, or until risen, golden but not too brown. The cakes should be spongy and resistant to the touch, and rise back up when pressed lightly with the finger. The fruit will have formed dark, enticing pools of colour across the surface, which permeate and marble deliciously throughout the cake below. Remove from the oven and leave to cool until lightly warm or room-temperature. Serve with a light drizzle of pouring cream, or double-cream whipped up with vanilla powder and a little sweetener for that extra touch of indulgence! A sumptuous and decadent treat, that’s so light on the carbs, you can feel free to have another slice! 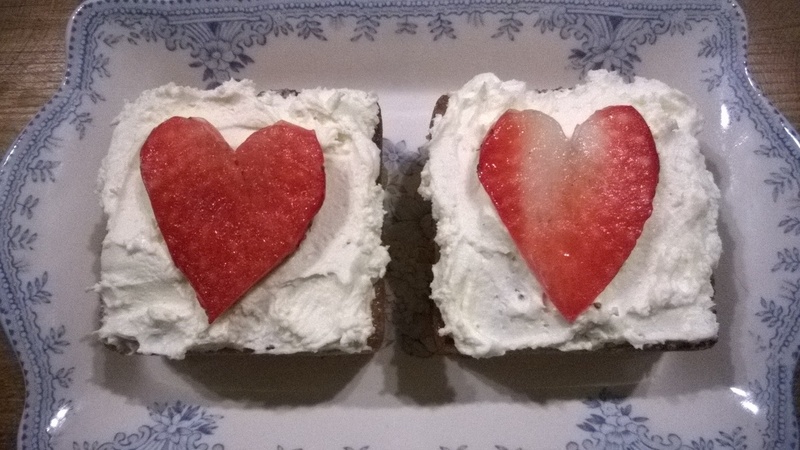 These delicate and delicious strawberry, almond and pecan cakes couldn’t be simpler to make – the perfect dish for Valentine’s Day or equally good at any time of year when you happen to feel like spoiling someone! The sweet perfumed scent of strawberries is complimented wonderfully by the dense, nutty crunch of pecans and soft cloud-like swirls of whipped cream. Quite simply heaven on a plate! 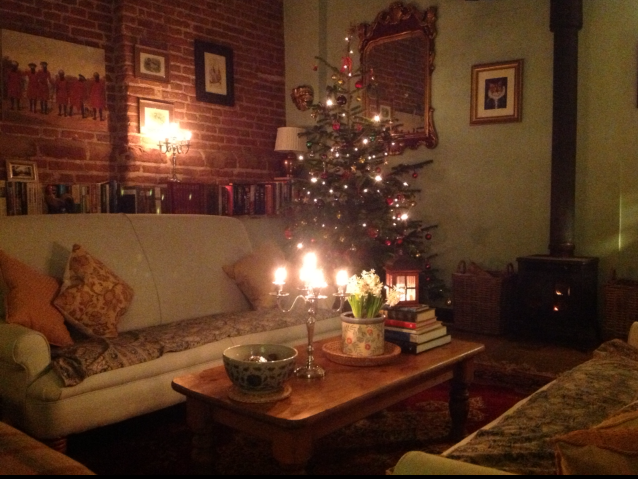 The classic adage goes ‘say it with flowers’. I certainly don’t disagree with that, but flowers and cake are infinitely preferable in my book; so pull out all the stops and show someone you love them with a little bit of good old fashioned baking! They also say that ‘the way to another’s heart is through their stomach’; but so often with flour- and sugar-free cakes, the results can be a little disappointing. Not so with these however! The taste and texture of this recipe is so similar to a classic sponge-cake that you’d never know it’s low-carb. This makes it the perfect thing to serve up to diabetics, paleo-fans, gluten-intolerants and those on a ketogenic-diet. Both heart and stomach will be won over; so give them a go! To make the cake, measure up 6oz of xylitol sweetener and 6oz of unsalted butter. I always use xylitol in baking. In my experience, it’s the only sweetener which retains its sweetness once cooked; and its granular texture means that it behaves exactly like sugar in cake-recipes. Cream the two together by hand until they’re light and fluffy, then give your hands a good wash before whisking up the eggs. Break 3 eggs into a bowl and whisk lightly with a fork until smooth. If you’re using vanilla-pods, scrape out the seeds of one pod and add this to the mix. If you prefer dried vanilla powder (as I used), half a teaspoon should be more than enough. You can equally use vanilla-essence, but this tends to contain liquid sugar-syrup, which isn’t ideal from a carb-perspective. If you choose this option, make sure to read the label carefully! Weigh up 6oz of ground-almonds and stir in 1 teaspoon of bicarbonate of soda. Fold this into the mix; again at an angle, making sure to lift and turn, so that the mixture rises and falls back onto itself. It’s best to use a sturdy metal spoon, as this will afford you the greatest control. Fold the dry ingredients in until you have an obliging dropping-consistency, which is a pale yellow in colour. Roughly chop a good handful of pecans and three or four strawberries and fold these in at the last minute. Then spoon the cake-mix into your cake-tins. I used small, individual squares, but this can equally go into one larger tin; round or square to your preference. Bake in a moderate oven for circa 25-30 minutes, until risen, golden but not too brown. The cakes should be spongy and resistant to the touch, and rise back up when pressed lightly with the finger. Remove from the oven and cool thoroughly until room-temperature. Once the cake is well cooled (it needs to be cool, or your icing will melt); place 6 large tablespoons of double-cream into a bowl. Add half a cupful of table-sweetener (this can be other than xylitol, because it’s uncooked) and a third of a teaspoon of vanilla powder. Whisk the lot with a balloon-whisk until the cream is just starting to form peaks. Make sure not to over-mix or it will separate. We want it still nice and soft – spreadable is the key! Test for sweetness, adjusting vanilla or sweetener levels to your preference. Serve with a final halved strawberry and a light drizzle of pouring cream for that extra touch of indulgence. Once you’ve made these, love will be in the air with every mouthful! Even St Valentine himself couldn’t resist a second helping! Thanks for reading and happy Valentine’s Day from the Low Carb Kitchen! Light & Delicate ‘Classic Vanilla Soufflés’ – the perfect low carb pudding! Soufflés are truly the perfect low carb pudding! Light, airy & indulgent; few things can be more delicious or quick to prepare. The texture is melt in the mouth, like eating ‘a cloud’; and when you break the surface with a spoon, the most delicious scented ‘sigh’ emerges, resplendent with delicate aromatic vanilla. It’s definitely one of those ‘me moments‘, which we all need more of in life! 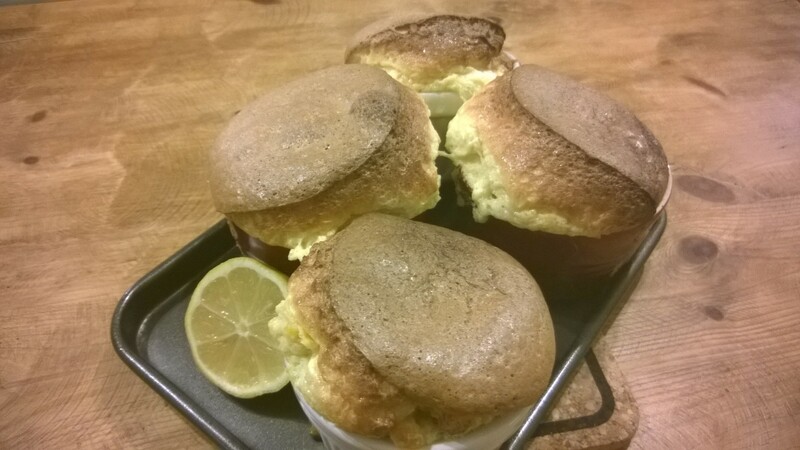 People are often afraid of soufflés, believing them to be difficult or high risk! Well that belief couldn’t be further from the truth. If you’ll excuse the pun: they’re a piece of cake! All you have to do is understand the process, then you’re off and away! When you cook an egg it turns from liquid to solid. You see this when you fry an egg, scramble it, poach it &tc. It’s the protein which solidifies in heat; and a soufflé is no different from this. The act of a soufflé rising is the same as a standard cake. Hot air rises, which lifts the mixture upwards. Then, once the right temperature is reached, the heat solidifies the egg-proteins and the air-bubbles are ‘locked’ in place. Meringue has the same process – the proteins form a hard, crystalline structure which supports and holds up the rest of the mixture – quite simple, and quite marvellous! If the egg-whites hold something up, what is it they’re holding? The answer to this is your soufflé mix, which carries the flavour of whatever you’re cooking. In this recipe I’ve chosen classic Madagascan vanilla, as I find the soft, perfumed aroma perfectly suits the light, cloud-like texture of the soufflé itself. You can use any number of things however – lemon, orange, chocolate, coffee; you can also make savoury soufflés (watch this space…!) with ham, cheese, garlic &tc. The process is the same for all. Whatever your ‘flavour-bearing mix’ is made of, you need to ensure that it’s the texture & consistency of melted chocolate. It’s that easy. Follow this rule of thumb and you’ll have perfect soufflés every time! Before I jump the gun and detail the recipe in full, it’s worth noting that these are wonderful for a ketogenic diet, as they contain virtually no carbohydrate! This makes them ideal for diabetics or those who do not include gluten in their regime. I use almonds in this recipe, but you don’t even need those. You can make soufflés with no ‘solids’ at all; just the basic ingredients. This means they’re cheap, versatile and incredibly quick! Now do you see why I love them? Start by preparing your soufflé dishes. Butter these liberally with a piece of greaseproof-paper. Your soufflés will rise better if you give them something to climb up, other than just butter. What do I mean? They’ll climb the walls of the dish a lot more reliably if they get a handhold – sprinkle some ground almonds or sweetener around the ramekin, all over the butter. This gives them a ‘rough surface’ to grip to as they rise. I must confess in this recipe however, I did these with just butter. I wanted to demonstrate that you can still get great results if you simply follow the principals of the exercise, without insisting on rigid doctrine & process to the letter! My aim is to demonstrate flexibility, not a sequence of off-putting rules! They’ve therefore risen higher on the side with the greatest heat – you’ll find that the rising will be more uniform if you treat them a little better than I did, and give them a ‘trellis’ to climb up! Once your dishes are ready, you can start your egg-whites. In a clean mixing-bowl (I use a copper bowl as this stabilises the whites far better than anything else); separate 4 eggs, placing the yolks in a smaller bowl to form your mix. When it comes to separating eggs, I must admit to ‘not being flashy’. I simply crack them on the side of the bowl and strain the white through my fingers. Once your eggs are separated, whisk the whites until they form stiff peaks. Volume should be minimum 8 times what you started with, and you should be able to upturn the bowl over your head and the mixture stays in situ (if it doesn’t then you have only yourself to blame!). The whisking forms valuable aerobic exercise for the cook. I strongly recommend that you do it by hand and don’t cheat by using an electric whisk! This way, you get to ‘understand’ the ingredients more, and get a true feel of how things work. 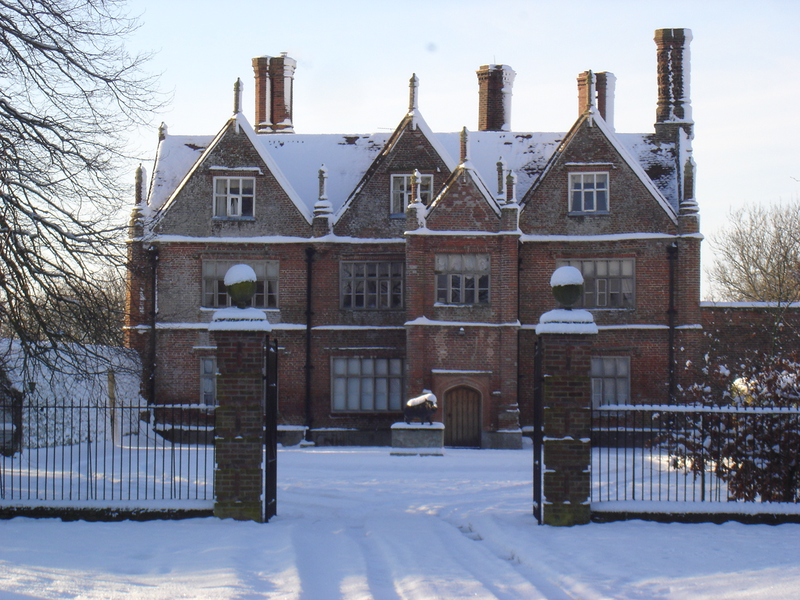 As you will however – no-one’ll ever know if you cheat! Into the bowl with the egg-yolks, pour in a half-teaspoonful of good vanilla-essence or powdered vanilla-seeds. If using essence, make sure to check the label to see that it contains no sugar. Add a tablespoon or so of ground-almonds & half a cupful of sweetener, then whisk well. I always use xylitol in baking. In my experience, it’s the only sweetener which retains its sweetness once cooked; and its granular texture means that it behaves exactly like sugar in recipes. Now bear in mind my rule of thumb above. You want this mix to be the consistency of melted chocolate. To achieve this, mix in double-cream until you have the right texture. You shouldn’t need much; three of four tablespoons maximum. Ladle the mix into your prepared ramekins until they are a few millimetres shy of the top. Place these onto a tray and into hot oven they go for circa ten minutes. If your oven has a glass-front, you can have the joy of watching them rise. I’m fortunate enough to have an aga, which means I can open the door and peek in with no danger of the temperature falling. You know they’re ready when well risen over the surface of the ramekin. The top should be lightly firm to the touch and evenly coloured. I always like to have a slight crispness on top, to contrast with the smooth inner, but that’s up to you. Experiment with your results – you’ll soon find out how you like them best. Serve up straight from the oven. They’ll sink down within a couple of minutes (trying to photograph them before this happened was not easy and they were a little more magnificent than this when first out of the oven). A drizzle of cream on the serving plate will add a little richness, or whip more vanilla into double cream and serve up a dollop on the side. Either way – pure heaven in a pot! 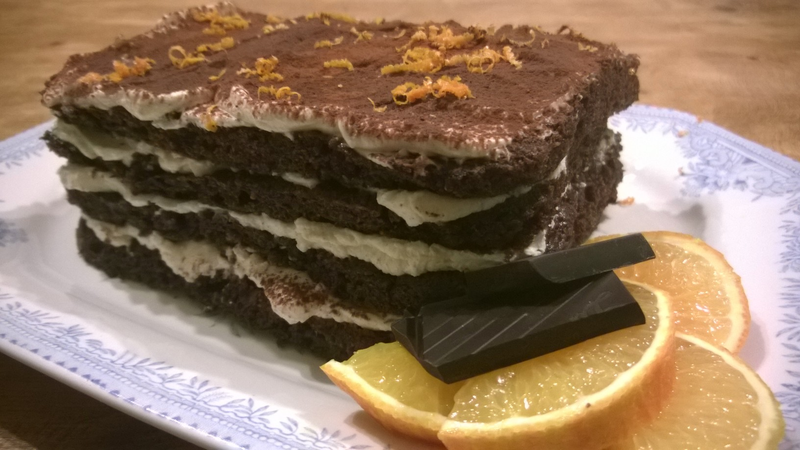 Indulgent Dark Chocolate Orange Layer Cake – a low carb, diabetic-friendly slice of paradise! Measure 4oz of xylitol sweetener into a bowl. I always use xylitol in baking. In my experience, it’s the only sweetener which retains its sweetness once cooked; and its granular texture means that it behaves exactly like sugar in cake-recipes. Cream this with 4oz of unsalted butter, then mix in 2 beaten eggs. When smooth, fold in 4oz of ground almonds, a half-teaspoon of baking-powder and 1.5oz of good quality cocoa. The texture should be a spreadable, if reluctant dropping-consistency. Line two 9×7 inch baking-trays or one larger tray. Spread the mix thinly so that it just covers the bottom of the tray. Bake in a moderate oven for 15-20 minutes until the cake is resistant to the touch and springs back when pressed. I would certainly check after 15 minutes – as this is a layer-cake, we’re not anticipating much ‘rise’. The trays’ shallow depth and large surface area will mean this cooks quickly! 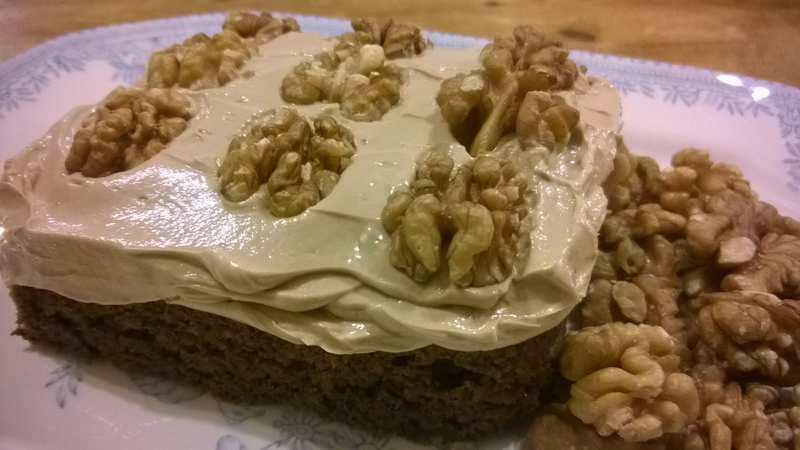 Whilst your cake is cooling on a wire-rack, make your icing. Take 10 and a half ounces (300ish grammes) of cream cheese and place into a mixing-bowl. 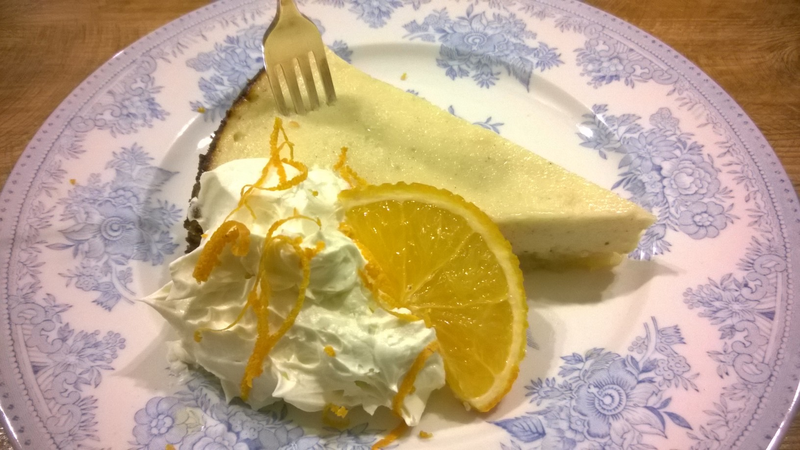 Shake in a half-cupful of powdered table-top sweetener (not xylitol, as the icing is not being cooked); a cupful of whipping-cream, a half teaspoon of powdered vanilla-seeds & the zest of an orange. Whisk these together until thick and spreadable. Taste for sweetness, adjusting if necessary. Once your cake is thoroughly cool, cut each rectangle in half; or if you baked it all on one tray, cut this into four equal oblongs. Place your first layer onto your serving-plate then spread a generous coating of icing atop the cake. Place your 2nd layer above this, and repeat until all four slices and icing are used up. Finally dust with cocoa-powder and a last sprinkle of orange-zest. Voila! Few things can beat this recipe. It’s totally delicious. Don’t just take my word for it however; try it yourself. When you do, let me know you get on. 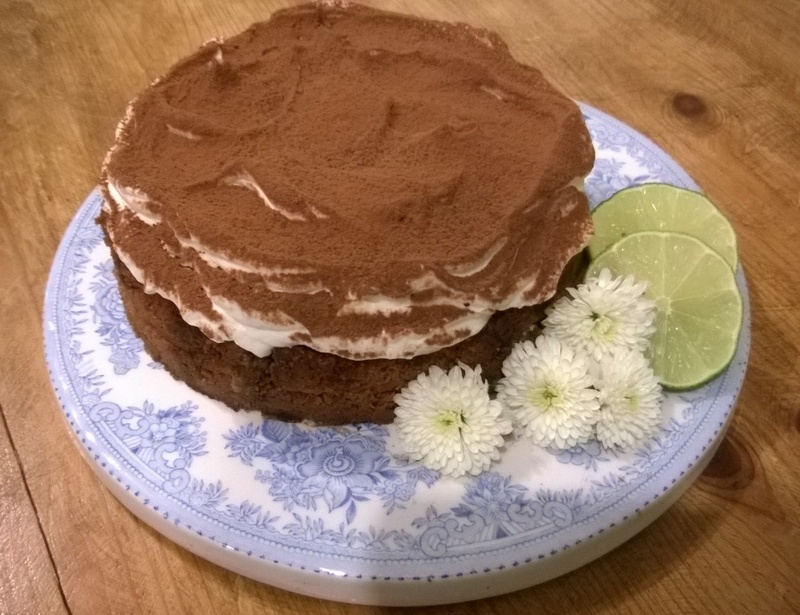 If it’s not the best low-carb cake you’ve had all week, your money back! 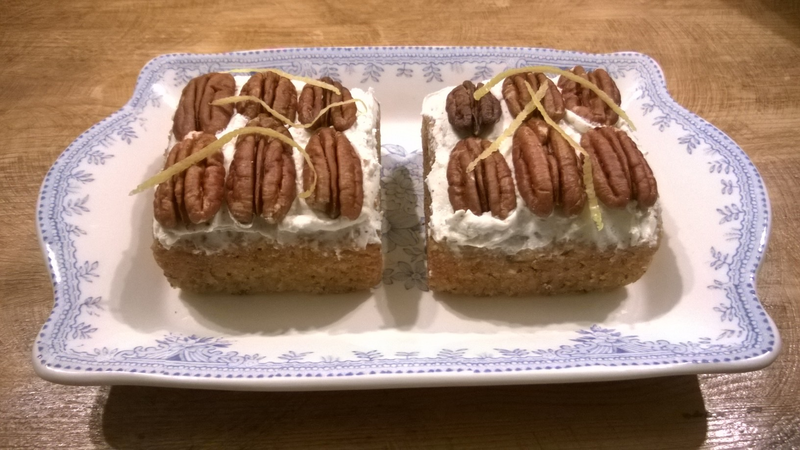 Madagascan Vanilla & Pecan Crowns – Delicately Sweet; Deliciously Low-Carb! The soft, smooth, warm taste of vanilla is a wonderful thing. So often people simply use it as a background flavour, which never quite does it justice. When allowed to take centre stage, it delivers stunning results. This cake fills the kitchen with the true old-fashioned scent of baking. The sweet delicacy of vanilla goes perfectly with the chewy, nutty crunch of pecans. The combination is so delicious that you’d never know it’s low-carb. This makes it perfect for diabetics, paleo-fans, gluten-intolerants and those on a ketogenic-diet. To make the cake, weigh up 5oz of ground-almonds and 5oz of dessicated coconut. Place in a sturdy mixing-bowl and stir in 1 teaspoon of bicarbonate of soda, plus the same of flaxseed. If you’re using vanilla-pods, scrape out the seeds of one pod and add to the mix. If you prefer dried vanilla powder (as I used), half a teaspoon should be more than enough. You can use vanilla-essence but this tends to contain liquid sugar-syrup, which isn’t ideal from a carb-perspective. Measure 3oz of xylitol sweetener and add this to the mix. I always use xylitol in baking. In my experience, it’s the only sweetener which retains its sweetness once cooked; and its granular texture means that it behaves exactly like sugar in cake-recipes. Set 2 large tablespoons of coconut-oil to melt by the range; or microwave it until liquid. Finely grate the zest of an orange and add both this and the coconut-oil to the mixing-bowl. Stir in 3 beaten eggs and a good handful of chopped pecans. Fold these in until you have an obliging dropping-consistency. Spoon the cake-mix into your cake-tins. I used small, individual squares, but this can equally go into one larger tin; round or square to your preference. Bake in a moderate oven for circa 30 minutes, until risen, golden but not too brown. The cakes should be spongy and resistant to the touch, and rise back up when pressed lightly with the finger. Remove from the oven and cool until room-temperature. Once the cake is thoroughly cooled (it needs to be cool, or your icing will melt); place 4 large tablespoons of cream cheese into a bowl. Add half a cup full of table-sweetener (this can be other than xylitol, because it’s uncooked) and a third of a teaspoon of vanilla powder. Fold through with a knife until vanilla seeds are evenly dispersed into the mixture. Make sure not to over-mix or it will go runny. Test for sweetness, adjusting vanilla or sweetener levels to your preference. Layer the frosting generously atop the cakes with a palette-knife. Top with pecan nuts and lemon zest to decorate. Serve with a light drizzle of cream for that extra touch of indulgence. Once you’ve made this cake, you’ll go back to it time and time again – it’s a true classic in the making! 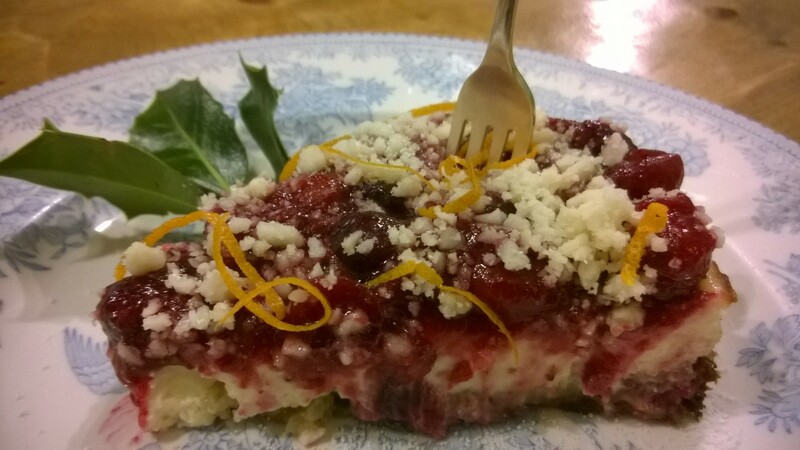 Velvety Baked Vanilla Cheesecake – diabetic-friendly, gluten-free & LCHF! Who needs carbs? There are some low-carb puddings that taste like ‘diet food’. Take my word for it; this one doesn’t! Who’d have thought you could eat cheesecake and still lose weight? It’s things like this that make a ketogenic-diet a true pleasure to follow. And because it’s made with Xylitol & ground almonds, they’ll be no impact to your blood-sugar. This makes it diabetic-friendly and an excellent choice for those with an intolerance to wheat. Take a teacup full of ground almonds and half a cup of dessicated coconut. Mix this with half a cup full of Xylitol and then pour in double-cream until the mix clumps together but is not ‘wet’ (circa half a cup…?). The mixture should be shape-able. Bake the base in a medium oven for 15 minutes, or until it’s very slightly brown and feels ‘just set’ to the touch. Empty 2x 200g packets of cream-cheese into a bowl and crack in two eggs. Add half a cupful of Xylitol and a further half cup of double-cream. Now shake in a good half-teaspoon of powdered vanilla seeds or the equivalent of one pod. You can use liquid essence, but this tends to contain sugar-syrup. Whisk the mixture until ‘divinely smooth’ and give it a taste. It should taste rich, creamy, fragrant and perfect. If not, eat it all and start again! Ladle the cream-cheese mix lightly on top of your base. Bake in a medium oven for 25 minutes, then turn the oven down to low and bake for a further 20 minutes. You want the mix to wobbly very slightly when the tin is nudged, but not appear liquidy. It should only bear very light traces of brown on top. If golden or cracked, then you’ve unfortunately cooked it for too long or too high! Leave the cheesecake to cool until room temperature, then remove from the tin. Refrigerate for one hour until lightly chilled. Serve with a dollop of whipped cream and strands of orange zest for additional fragrance. Did I mention it’s delicious? Oh yes, I think I did. 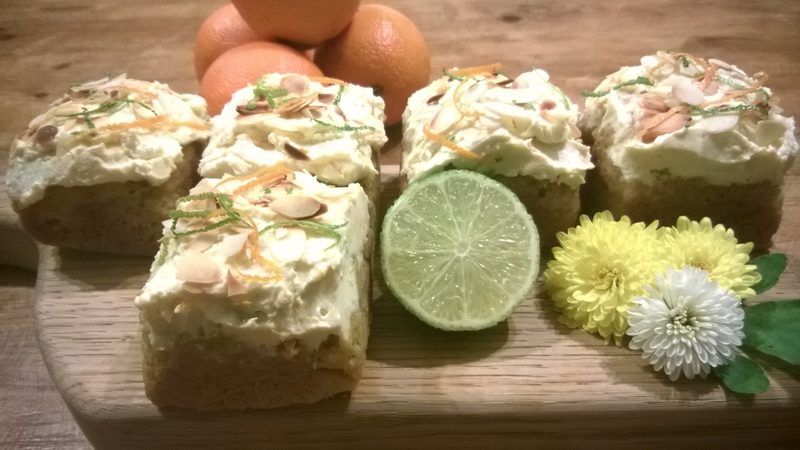 Orange, Coconut, Lime & Almond Cake with Zesty Cream-Cheese Frosting – you’d never it know it’s low-carb! Nor would your blood-sugar! A lot of low-carb baking recipes feel very much the poor relative of their high-glucose cousins. You often feel that you’re eating a sterile ‘copy’, which doesn’t do justice to the original, & is tinged throughout with disappointment. No so with these! I cannot advocate this recipe enough! The citrus zing is just what the doctor ordered on a gloomy autumn day. The density of the ground-almonds & coconut lends the cake that really ‘substantial’ feeling – exactly where most flour-free cakes fall short of the mark! It’s difficult getting as far as applying the icing – the urge to dig in whilst they’re still warm is almost overpowering! The same goes for the frosting itself… One taste will never be enough to check the flavour! Because the cake is incredibly low in carbohydrate, it’s perfect for diabetics, paleo-fans, gluten-intolerants and those on a ketogenic-diet. It’s truly astounding that you can eat this and lose weight. Pinch me…! Set 2 large tablespoons of coconut-oil to melt by the range; or microwave it until liquid. Finely grate the zest of 1 large orange and add both this and the coconut-oil to the mixing-bowl. Finally, stir in 3 beaten eggs, the juice of one lime, and fold until you have an easy-to-please dropping-consistency. Once the cake is thoroughly cooled (and yes; it needs to be, or your icing will melt everywhere); place 4 large tablespoons of mascapone into a bowl. Add half a cup full of table-sweetener (this can be other than xylitol, because it’s uncooked) and the zest of an orange. Fold through with a knife until the zest is pleasingly dispersed into the mixture. Make sure not to over-mix or it will go runny. Test for sweetness, adjusting zest or sweetener levels to your preference. Layer the frosting generously atop the cakes with a palette-knife. This is not a time to scrimp! Sprinkle with more grated zest and lightly toasted almonds to decorate. Thanks for reading & bon ap! Zero-Carb Crackers! Truly a food revelation. The joy of the cheeseboard is back! Try them as a starter with dip, pâté or salads. The choice is all yours! One of the added bonuses of a ketogenic, low-carb diet; is that it forces one out of one’s comfort-zone to try something new. I’ve always been quite traditional in the kitchen, so I was really not sure how I’d feel about these zero-carb crackers. Firstly, they’re cooked in the microwave, which the food-snob in me abhors! Secondly, the ingredients-list hardly sounds appealing… Flax-seed, water and dried-herbs (yes, I know). I took the basis for this recipe from the New Atkins UK website. I almost couldn’t bring myself to try it; but the cook in me was intrigued…the recipe sounded such a strange thing. But guess what? I tried them and they’re brilliant! 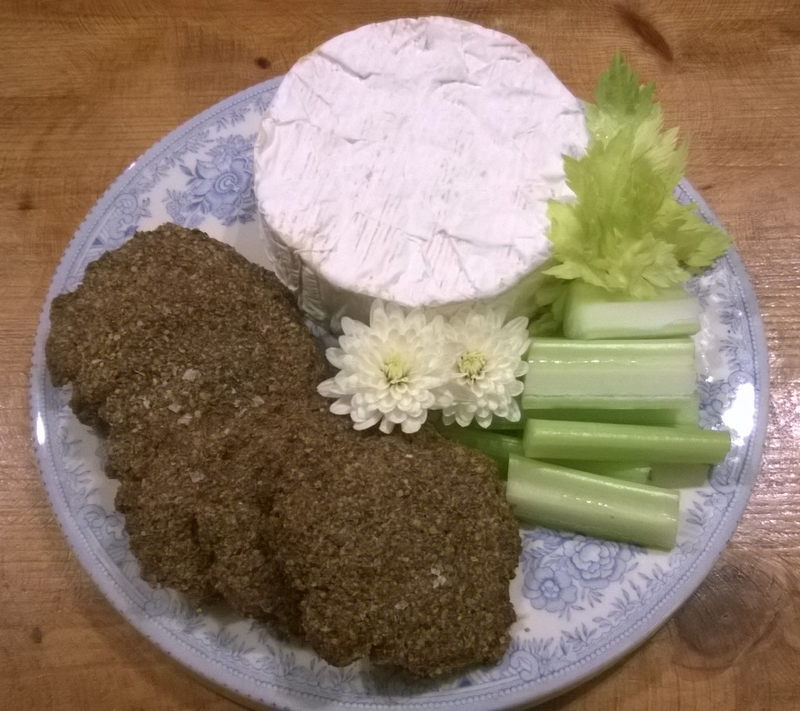 Whilst cheese has always been on the ketogenic-menu; the cheese-board rather lacked something with a bit of bite. Sure; you can have celery; but it’s no real replacement for crackers. But now you don’t need one! Take four tablespoons of flaxseed and a good pinch of salt. Sprinkle in some dried herbs; I used sage because of its warmth of flavour, but thyme would also be lovely. Grind in a generous whack of black-pepper, then slowly mix in cold water until the ingredients come together to form a cohesive paste. This will probably be about 60ml. Leave for five minutes to bind, then spread flat onto non-stick baking-paper with the back of a spoon. Neaten the edges, then microwave full power for circa 2.5 minutes, until the crackers are solid and crisp-feeling to the touch. Sprinkle with a final pinch of salt and serve alongside your cheese. For variation, try adding a pinch of dried-ginger or cumin. The above quantities should make 6 generous crackers, depending on size. You’d never know these were low-carb! They also work brilliantly as an accompaniment to starters (picture pâté, mackerel or a selection of dips). Because of this, I’ve included this recipe in the ‘starters’ section, as well as ‘puddings’ for the cheese-board. 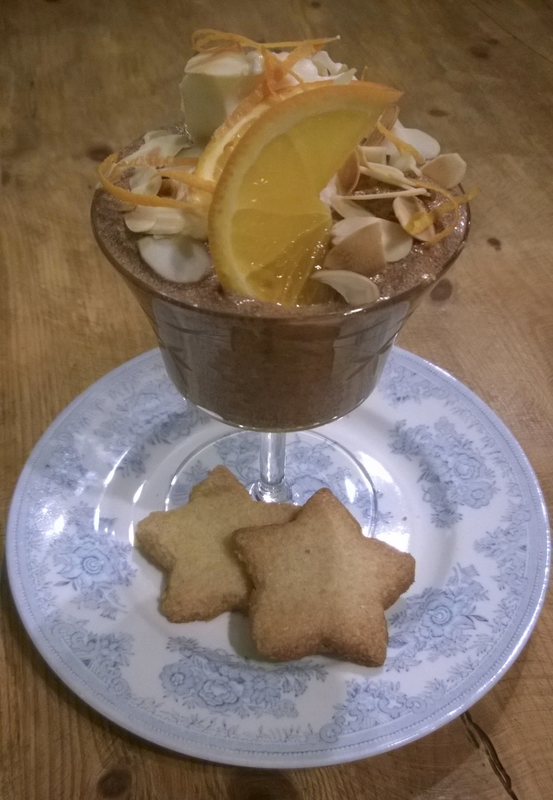 Chocolate-Orange Mousse with Almond Stars – incredibly quick & easy! 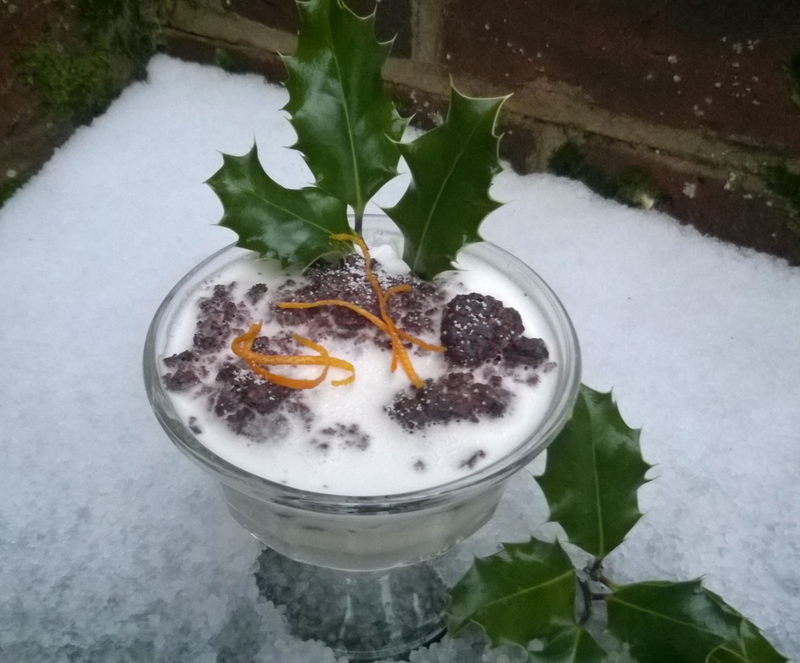 A diabetic, low-carb pudding that tastes anything but! For diabetics and ‘low-carbers’ alike; one of the things you miss most is that baked, ‘cakey’ texture. Although cooked like biscuits; these almond stars have the mouth-feel of dense cake. You can obviously make this dish without them, but the variation in texture provides a welcome change, and rolling out dough is such a rare treat nowadays as to be seized by the horns at every opportunity! Start with the biscuits. Cream 2oz unsalted butter with 2oz Xylitol. This is the only sweetener I have found which is 100% natural, doesn’t lose its sweetness through cooking & behaves exactly like sugar in cakes. It’s granulated, so creams exactly the way a traditional caster sugar would. I can’t praise it enough! Please note – always use your hands for making cakes / biscuits. The warmth of your hands makes the butter so much more workable and it’s the only way to truly ‘feel’ for lumps. Your hands are nature’s whisk. Use them! Once butter & sugar are light and fluffy, mix in 4oz ground almonds. Roll dough out quickly to prevent it sticking to the roller. Cut into whatever shapes you like and bake for 20 mins in a moderate oven until the surface starts to go golden. At this point, they’ll still be very soft to the touch, but will harden up as they cool. For the mousse, add to a mixing-bowl half volume of mascapone to double-cream. Judge all volumes by eye as to ‘how much mixture you wish to end up with’. Pour a little hot water onto your sweetener to prevent it being grainy, then add to the mix. Sieve in a good tablespoon of cocoa powder & a splash of orange-oil or essence. Whisk up until thick and heavy, checking finally for sweetness & flavour. Make any adjustments necessary e.g. more orange, sweetener or cocoa to preference. Spoon into bowls and top with a little whipped cream and toasted almonds. Cool in the fridge until your biscuits are room-temperature; then dig in! 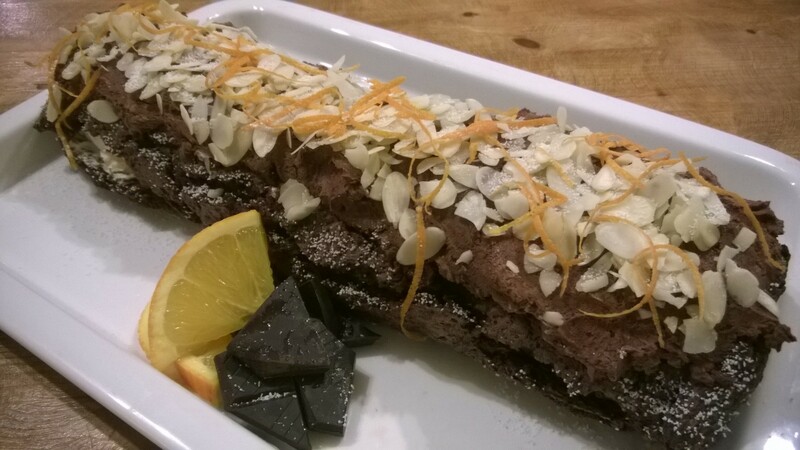 Tira Misu Cake – the ultimate low-carb, diabetic dessert! Rich, dark & luxurious – tasting is believing! Who needs carbs? This tira misu cake is every bit as good as its traditional full-carb cousin; just in cake form! It’s perfect for diabetics or those on a ketogenic diet, & couldn’t be simpler to make! 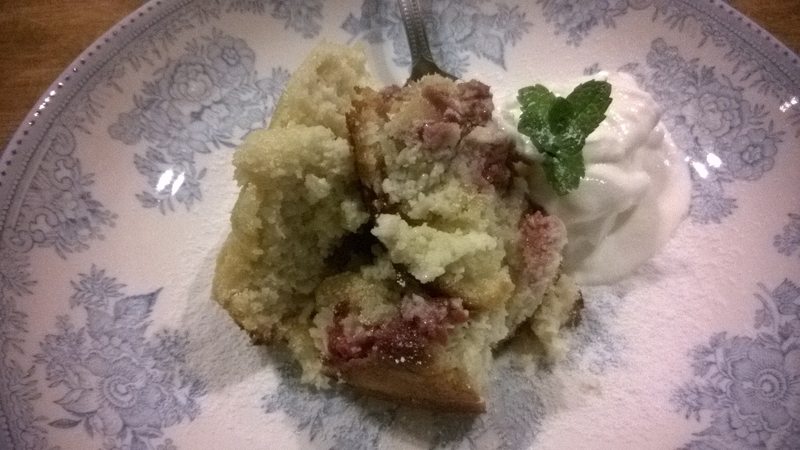 I haven’t put a pudding on this blog yet, so I was determined to go for one of my favourites. This recipe is incredibly morish. Because it’s make with almonds, it has that rich, moist, heavy denseness, which is decadent & indulgent; but also gratifying & filling. And the cherry on the cake? No carbs! It’s amazing to think you can eat this kind of thing on a diet! The ketogenic diabetic can also dig in without guilt. A true winner! The cake-base is best made the day before (unless you have a long leisurely day ahead of you). Quantities can also be doubled to make a larger cake. Cream 4oz of unsalted butter and 4oz Xylitol sweetener in a mixing-bowl. Two comments to make here: firstly, Xylitol. This is the only sweetener I have found which is 100% natural, doesn’t lose its sweetness through cooking & behaves exactly like sugar in cakes. It is granulated, so creams exactly the way a traditional caster sugar would. I cannot praise it enough! Second comment? Always use your hands for making cakes. The only part where you need a utensil is when folding in the dry-ingredients. The warmth of your hands makes the butter so much more workable and it is the only way to truly ‘feel’ for lumps. Your hands are nature’s whisk. Use them! So once the butter & sugar are light & fluffy, incorporate 2 beaten eggs with vanilla extract mixed in. Don’t worry if the mixture curdles slightly; if it does, I have still never made a bad cake through that happening! Once the mix is as smooth and aerated as you can get it, fold in 4oz of ground almonds. Into a lined cake tin it goes, to bake in a moderate oven until lightly golden and firm on top. I have a Rayburn / Aga; so cooking time is less essential than in a fan or gas oven. I should imagine gas mark 4, or 180 degrees for 30-40 minutes. 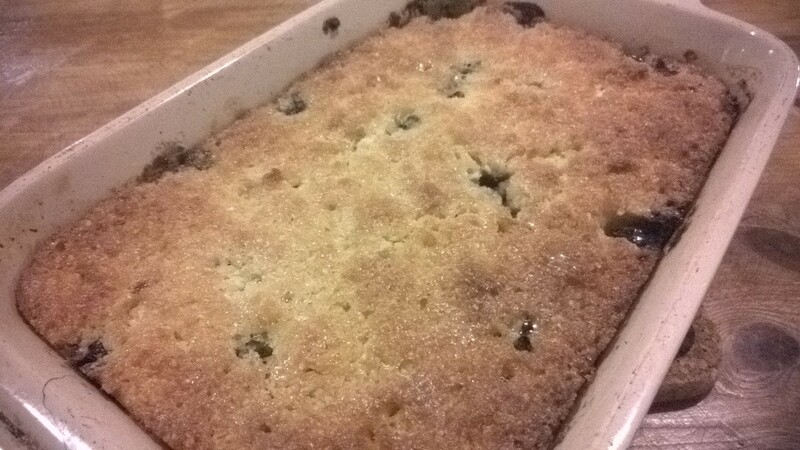 Take out of the oven and leave to cool until it is ‘convincingly’ room-temperature. To make the topping, boil a little water and add circa 2 table-spoons of Xylitol / sweetener into a mixing bowl. Pour on the same quantity of hot water so that the sugar loses its graininess (nothing worse than icing with a bite!). Add to this a tablespoon of orange-liqueur or brandy (this is where your only real carbs will come from), 2 table-spoons of mascapone & the same volume of whipping-cream by eye. Whisk up with a strong elbow, until the mix is stiff and spreadable. You can use an electric whisk / blender, but please note: I consider that cheating! Check the taste to adjust the sweetness / booziness to your preference. If you have a larger cake (or lots of patience) you can slice the cake horizontally to put filling in the middle. This does look a lot more ‘sumptuous’ but beware; almond cakes are far crumblier than their flour counterparts. Be prepared for a bit of cracking and re-sticking if you attempt this! Because it’s a Monday night, and mine is only a 4oz cake; I have chosen to just put the icing on top. Whichever route you take, the cake-layers will require addition of coffee & liqueur. With a sharp knife, spear the cake so that the liquid has plenty of holes to run into. With a soup-spoon, ladle on coffee (strong instant or espresso) then your liqueur. Volume is to preference. I like it strong, but this will equally affect the texture. If you wish for a drier cake, then add less liquid. As a guide, I used about 8 tablespoons of coffee & 4 tablespoons of liqueur. Once the cake is ‘dowsed’, spread the icing in as generous proportions as you can get away with, without being gratuitous. Place cocoa powder into a sieve or tea-strainer and give the finished article a thick and luxurious dusting. The only thing left to say… Enjoy!